Super Bowl parties are as much about great snacks as they are watching the game. So, with game day fast approaching, we at Maker’s Mark would like to share with you easy ways to can kick-up fun finger foods with bourbon. Notes: Greek yogurt and ricotta cheese lighten up this usually mayonnaise heavy party favorite. 1. In a wide heavy-bottomed pot, heat the olive oil over high heat. Add the sliced onions and the teaspoon of salt. Sauté the onions, stirring often until they begin to soften, 5 to 6 minutes. Reduce the heat to medium and continue to stir and cook the onions until they begin to color, about another 15 minutes. Add 1/2 cup of bourbon to the pan and stir in. Reduce the heat to low and cook the onions for another 30 to 40 minutes, stirring occasionally, until the onions have colored and caramelized. Remove the onions from the pan and spread on a plate or baking sheet to cool in the fridge. 2. Using a food processor or blender, combine the ricotta and yogurt and process until smooth. Transfer the mixture to a bowl. Fold in the sour cream. Once the onions have cooled, rough chop them briefly. Fold into the mixture and season to taste with lemon juice, sugar, salt and pepper. 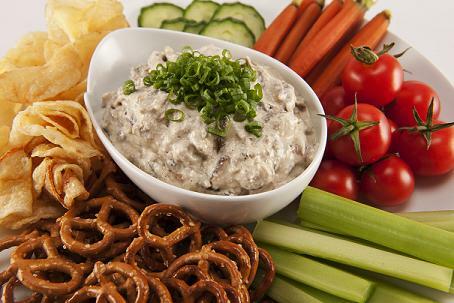 Serve the dip cold with crudité and chips. Looks delicious! Can't wait to try it on Sunday.